‘No experience no job – no job no experience.’ Caught in that vicious cycle? Of course you are smarty-pants! You spent the whole year partying, drinking, clubbing, chilling, and stuffing your face with food. Tuition sucked every last cent out of your bank account, the holiday’s are creeping up and that trip to Cancun with your friends is so tempting. But you remain jobless and not to mention, broke. (The whopping $5.36 between sofa cushions do not count!) What is worse, you still have a resume weaker than poorly brewed coffee because it’s missing that oh so essential ‘experience.’ It finally sinks in, something has to be done. Yes, fellow university peons, there is still hope for you…. Hint number 1: networking. Almost everyone has ‘connections’ to get a deal on a snazzy pair of shoes or some electronic device, the same goes for jobs. Put down the remote control and contact friends, acquaintances, family and suss out their referrals, they all equal the ‘hidden job market’ (unadvertised jobs). After setting up a brief (keep it to ten minutes) meeting with a ‘connection’ the Youth Resource Network of Canada offers some valuable tips. 1. Be prepared. Dress in business attire and know prior what skills you want to present. Remember, just like a first date, you never get a second chance to make a first impression. 2. Honesty. Do not beat around the bush, let the ‘connection’ know why you are there. (People are friendlier than you think and are usually willing to help youth get on their feet). 4. No harassment. You do not want to end up with a restraining order because you have called the ‘connection’ ten times for the morning. A follow up call is sufficient. Even if you strike out with networking, you still have another excellent option: be your own boss. What can be better than being in control and working at your own schedule? With endurance, you can transform that ingenious idea you have been hiding from others, an artistic talent or weekend hobby into your own business! Young Canadians like yourself are doing just that, and you can check out these cool inspirational young entrepreneurs here on faze.ca (Teen Millionaires). While online you can surf over to some of the most helpful student employment sites on the web. Known as ‘Canada’s Campus Connection’, www.careermosaic.com is the perfect guide for Canadian university career centres across the country. 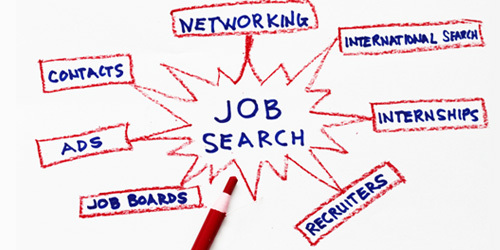 You can even take your job hunt a step furthur by posting your resume at www.careerclick.com or www.globecareers.com allowing employers to view your resume while you’re nodding off in class. Need more convenience than that? At www.monster.ca you can set up a personal electronic agent that will notify you via electronic mail of new job posting suiting your qualifications and criteria. Keep surfing and connecting to Human Resources Development Canada Youth Employment Strategy Link at www.hrdc.gc.ca is going to be one of your best bets. Since the ‘cash flow’ is not exactly flowing, pick up the phone and connect to their toll free number (1-800-935-5555) and take advantage of a free career planning kit including a youth resource booklet, a copy of realm magazine and an issue of Canada prospect newspaper. So you’ve finally snagged that interview for that perfect job, but are you prepared? Here is a sneak peek at just a few of the tips and advice available in the kit. The following sample questions an interviewer may ask get straight to the point and so should you. Prepare your answers ahead of time so that you will not be caught off guard. 1. Why do you want to work for this organization? 2. Describe the specific skills or abilities you would bring to this organization. 4. Why do you think we should hire you? Your job hunting work isn’t finished yet, there are also questions you should ask the interviewer to show your interest and discover if this is the job for you. 1. What will my duties and responsibilities be? 2. What is the appropriate dress code? 3. Will I receive training for the position? 4. Will there be any weekend/overtime or shift work? 5. When will I expect to hear from you about your decision? So, since the holidays are rolling around again, and you need money to support your lavish and entertaining life, crawl out of bed before noon, scrape together potential contacts, surf the web (not chat rooms), or simply pick up the phone to get started on the hunt of your life.